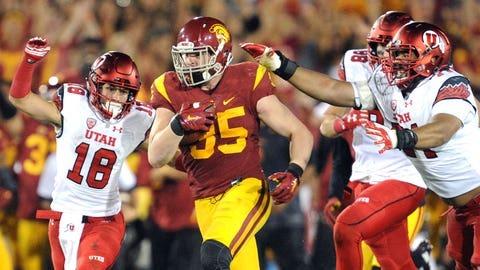 USC's Cameron Smith dominated Utah's Travis Wilson. USC freshman linebacker Cameron Smith looked lethal vs. Utah, interception quarterback Travis Wilson three times. Smith also recorded a 54-yard touchdown in USC's rout over Utah, which gave the Trojans momentum to beat the then-undefeated Utes. No other USC player had recorded three picks in one game since Jason Oliver vs. Penn State in 1991. Multidimensional, Smith also recorded nine tackles (most on team vs. Utah) and leads the team in tackles on the season, with 62.